Ouattara declares the "dawn of a new era of hope"
(CNN) -- Ivory Coast President Alassane Ouattara called for calm Monday after forces stormed the president's residence and arrested Laurent Gbagbo, whose refusal to accept the results of a presidential election last year plunged the West African nation into civil war. "Finally, we have reached the dawn of a new era of hope," Ouattara said in a televised address. "We had hoped this transfer had been different, but we have to focus on today." He urged his countrymen to lay down their weapons and said he has asked the justice minister to start legal proceedings against Gbagbo, his wife and his colleagues. Gbagbo is being held at the Golf Hotel, the headquarters of both Ouattara and the United Nations. Fighting appeared to quickly end after Gbagbo's arrest, said Alain Le Roy, under-secretary-general of the United Nations' Department of Peacekeeping Operations. "To my knowledge, most of the fighting has stopped," he said, adding that "there are pockets of resistance here and there." Gbagbo asked for and is receiving U.N. protection, according to Le Roy, who said forces are also ensuring the security of the former leader's wife. "I understand from President Ouattara that he wants President Gbagbo to go on trial in Ivory Coast," said the U.N. official. The former president "is well and alive and will be brought to justice," said the country's ambassador to the United Nations, Youssoufou Bamba. He and the French Embassy said forces loyal to Ouattara made the arrest. But a Gbagbo adviser, Ahoua Don Mello, said earlier that the French military had stormed Gbagbo's residence. The French Ministry of Defense rejected Don Mello's claim, saying no French troops entered the residence. Authorities are trying to move carefully and follow legal procedures to bring Gbagbo to trial, said a senior U.S. official with knowledge of the events, declining to be named because of the sensitivity of the situation. 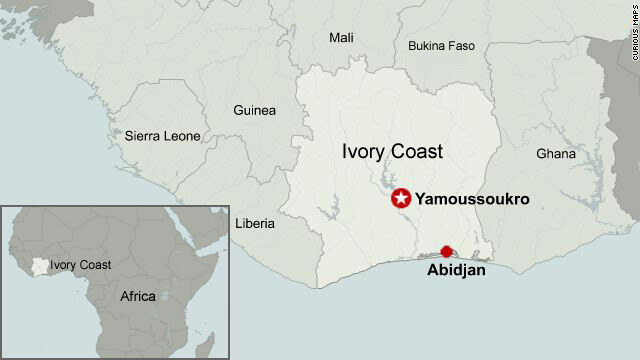 The arrest is a "step in the right direction to return Ivory Coast to normality," the source said, adding that the city of Abidjan is a wreck, with "death squads, militias roaming (and) burning bodies on the streets, which is posing a major humanitarian challenge." Speaking from inside the Golf Hotel, Gbagbo told his supporters to stop fighting. "I hope that people lay down their weapons and return to a normal state of civil rule so that the crisis can conclude as quickly as possible," he said. U.S. President Barack Obama cheered news of the latest developments in the Ivory Coast. "This represents a victory for the democratic will of the Ivorian people, who have suffered for far too long through the instability that followed their election," he said in a statement. Obama urged Ouattara and the people of the Ivory Coast to begin now the "hard work of reconciliation and rebuilding." U.S. Secretary of State Hillary Clinton said Gbagbo's capture "sends a strong signal to dictators and tyrants. ... They may not disregard the voice of their own people. "There will be consequences for those who cling to power," Clinton warned. United Nations forces were not involved in the raid on Gbagbo's residence, said U.N. spokesman Hamadoun Toure. He had earlier said the United Nations' mission did not extend to extracting the former president from his stronghold. But United Nations and French troops have pounded Gbagbo's forces, citing their mission to protect civilians in the country. The fighting left Abidjan with sporadic power and sanitation, and residents said dead bodies were left on the streets. At least tens of thousands of people have fled into neighboring Liberia to escape the fighting, according to Oxfam, the international aid organization. The International Committee of the Red Cross said that 800 people had been shot dead in the western cocoa-producing town of Duekoue during the conflict. A U.N. official put the death toll at 330 in the incident. In his televised address, Ouattara said he would set up a Truth and Reconciliation Commission to investigate allegations of human rights violations. United Nations Secretary-General Ban Ki-moon last week predicted that the outcome of the crisis in Ivory Coast would set the tone for other nations in Africa. "What happens in Cote d'Ivoire has huge implications for the continent that will have 16 presidential elections this year," he said, using the French name for the country.